Description: CSXT 4829, the last CSX SD70MAC, leads an earlier sister on train Q142 into Cincinnati, Ohio. Note the Cincinnati skyline in the background. Description: A pair of SD70MAC's lead CSX Q142 into Cincinnati. Description: CSX Q-108-15 rounds a curve on the CSX Indianapolis Line just east of Anderson. Description: Q-108-15 heads east on Track 1 on the CSX Indianapolis Line, also know as the Bee Line. 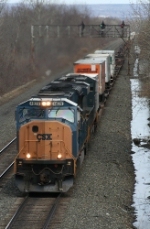 Description: A CSX SD70Mac and a SD-45 heads up Q-108-15 on Track 1 of the former Bee Line now called CSX ID. Description: Q425 has CSX 4829 and 4773 in charge today. 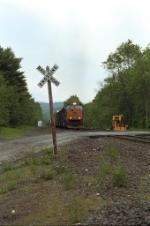 Title: CSXT Locomotive Leads NS 18N, BNSF Trailing @ 1008 hrs. Description: Without a doubt, CSX "future" paint scheme has to be the worst of the class one railroads! Description: U836 rolls by Point of Rocks Tunnel and under US15 with 3 helpers shoving on the rear end. Description: U836 will get help on the rearend at Brunswick to get her up the grade to Baltimore, also see this train in my Point of Rocks album. Description: a very clean 4829, the last 70mac before the ACe's start, leads 5375 around a wye with K650 in tow. Description: Q108 comes to a stop at CP-5. It has to wait for permission to enter the NYS&W yard. Description: Q173 goes through with an AC60,SD70MAC,and an ACE. Description: With the Ravens stadium in the background, 173 heads through Bailey's. Description: Amtrak & New England Central wait for CSX to clear the main in Palmer, MA. This meeting took place about 300 YDS east of the diamond crossing. Description: Q427 crosses Rt 10-202 Bridge at CP 107 in Westfield. Description: Q427 slowing for a yellow over red signal on track 1. Description: Q427 passing Westfield depot and the former Canal Line diamond. Description: Engineer of eastbound stacktrain Q190 bears down on a railbuff actually in the NS Morrisville Line guage ahead just under the PA turnpike. Description: CSX SD70MAC 4829 brings up the rear on this eastbound engine move. Description: CSX Q169 heads west.